Hanukkah begins on the night of December 8th. Which means it is coming really quickly. 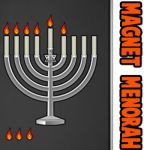 Today I’m going to show you how to make a Magnetic Hanukkah Menorah. This menorah is perfect for your children’s room, so they can light their own menorah. Or, if you have cats or toddlers in your house this menorah is perfect for you…. no need to worry about anyone knocking over the menorah and starting a fire. Light it every night of Hanukkah…. 8 wonderful nights. I have a fun craft for you today. 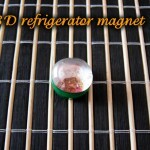 I’m going to show you how to make a 3D Refrigerator Magnet. 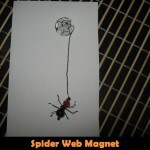 What’s really cool about Refrigerator Magnet crafts is that you always have a place to display your crafts proudly…. your refrigerator or any metallic surface. I know in my house I never have enough magnets to display all of my children’s artwork so this craft really came in handy with providing us with another magnet. Keep in mind that the picture in the center can be any picture you want…. I used a bear, but use any cute picture you would like. I have a great way to use up that Halloween Candy that you still have stashed away…. 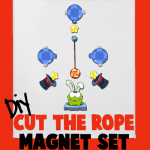 use them to make a Christmas Advent Calendar. That’s right…. I’m going to show you how to make a Candy Advent Calendar to Count Down to Christmas. This is a great way to get the kids excited about Christmas…. as if they weren’t excited already. 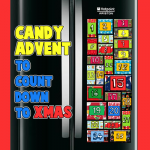 This Advent Calendar is a magnet craft…. perfect for displaying on your fridge. So, let’s get started. 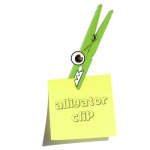 Do you want to learn how to make this adorable alligator / crocodile clip? When it is done, you can stick it on the refrigerator and post your memos in the alligator’s mouth. 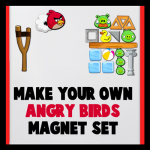 It is super easy to make, learn how to on the following page. 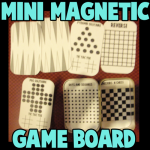 Today I will show you how to make a really cool travel board games kit out of magnets, paper and an altoids tin. This is a great travel game board system that you can stick in your pocket to bring to school with you to play on the bus, in the cafeteria, or what ever. You could even bring it in the car with you to play with your sisters and brothers with. Or you can just play solo since there are 2 different solitaire games to play. Dragons are an important part of many Chinese festivals, including Chinese New Year. 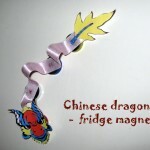 Let’s celebrate it by crafting this fridge magnet with the mini version of the dragon used during holiday parades and festivities.